Santa Barbara’s veterinarian community is mourning the losses of Dr. Amanda Lumsden (left) and Dr. Tiffany Margolin. Even among Santa Barbara’s exceptionally talented pool of veterinarians, doctors Tiffany Margolin and Amanda Lumsden stood out. 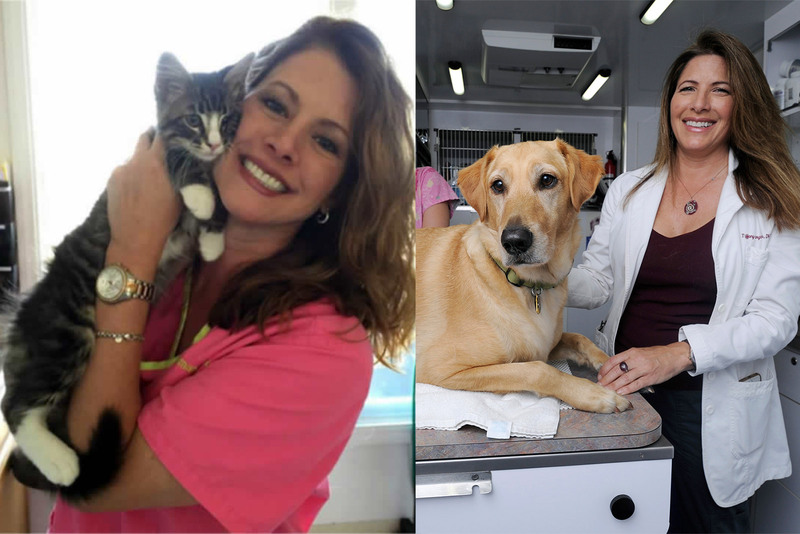 Both ran their own four-wheeled practices —­ From the Heart Mobile Vet and Cat Calls Mobile Veterinary Service, respectively —­ dispensing at-home care to sick pets. They did general medicine and performed surgeries, and each provided a specialty: Margolin was trained in animal acupuncture and herbal treatments, while Lumsden offered low-cost spays and neuters. Often, frequently more than once a day, they were called to euthanize terminally ill cats and dogs at the sides of their grieving owners. Online message boards are filled with gratitude for their difficult work. Multiple studies in recent years have revealed disproportionately elevated rates of depression, anxiety, and suicide among veterinarians in the United States. Their suicide rate is four times higher than the general population —­ higher than any other white-collar field. A Centers for Disease Control and Prevention survey of 10,000 practicing veterinarians showed they displayed signs of serious mental illness and feelings of hopelessness and worthlessness two to three times as often as the rest of the population. Similar statistics have been reported in Great Britain and Australia. “The stressors are very real,” explained Dr. Lex McKenna, who operates Santa Barbara’s Coastal Mobile Veterinary. “We’re in a very emotional industry for ourselves and our clients. We’re dealing with people’s loved ones.” While they’re empathetic animal lovers, veterinarians also tend to possess Type A personalities, or be perfectionists, said McKenna. They’re driven and determined and want to fix every ailment just right. So when treatment eludes them, it’s extremely difficult, said McKenna, especially when they lose patient after patient, a hazard unique to their particular medical field. It’s not unusual for veterinarians to work 12- to 14-hour days, McKenna went on, mainly to help as many animals as they can, but also to pay the bills. Like their human-doctor counterparts, vets graduate from medical school with heavy student debt, but throughout their careers even the most accomplished will only earn about half of what people physicians make. Add that student debt to a mortgage, living expenses, and van payments, and the financial burden can be overwhelming, McKenna said. Client demands can be trying, too. While most pet owners understand the limitations of veterinary medicine, many exert unfair pressure. “People expect miracle workers,” said McKenna. “Society has become so accustomed to immediate service and instant gratification, but we can’t always give that.” Vets are also pushed to perform their services at no cost. “Sometimes people get mad if they can’t pay,” said McKenna. They say, ‘If you loved animals, you’d do it for free.’” McKenna has seen her fair share of nasty online comments and worries about the effects of such cyberbullying. In October 2016, Margolin spoke at a panel organized by the Santa Barbara Association for Women in Communications called How to Handle Online Criticism. Veterinarians are trained to consider euthanasia as a medical option if all other treatments fail. “Some of us have sought that as an option, and it’s tragic,” said McKenna, who spoke of the great respect she maintains for Margolin and Lumsden, both personally and professionally. Ayl said it’s critical for would-be veterinarians to learn about “compassion fatigue” before beginning their careers and to understand ways to prevent burnout once they get their licenses. “It’s just a very unique, incredibly difficult field,” she said. “It’s not something kids think about when they grow up wanting to care for animals.” Just as important, Ayl went on, is to eliminate the stigma around reaching out for help, something especially difficult for the perfectionist personality types that dominate the profession. “We need to change the idea that reaching out means failing,” she said. If you or someone you know is thinking about hurting themselves, call 9-1-1 or the 24/7 National Suicide Prevention Lifeline at 1 (800) 273-8255. A list of regional resources can be found at countyofsb.org/admhs. To learn about Vets4Vets, a confidential support group for veterinarians, visit vinfoundation.org.